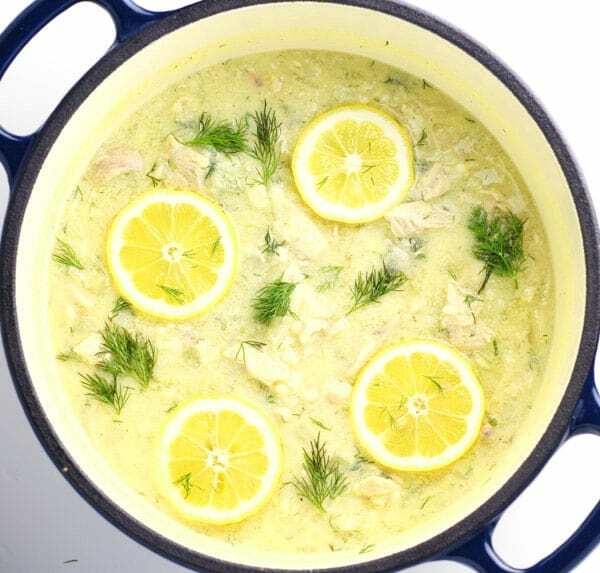 Greek Lemon Rice and Chicken Soup also known as Avgolemono is now one of my favorite easy soups to make! I know this yummy soup has been around for a very long time, but my first time trying this was last year when I visited San Francisco. San Francisco is an amazing foodie city where you can find restaurants that serve food from all different parts of the world at any given time of the day. 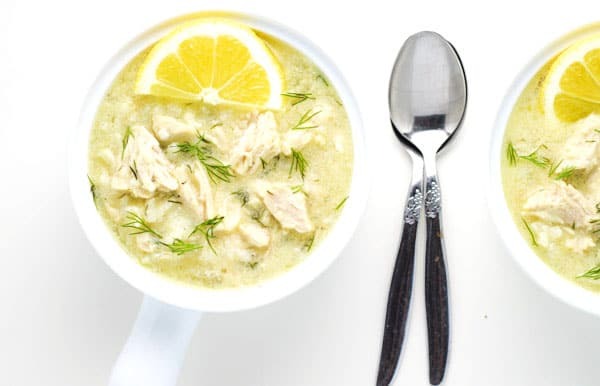 We came across a lovely Greek restaurant in the Haight-Ashbury neighborhood where I tried a Greek Lemon Rice and Chicken Soup. My taste buds were bursting with every single bite. It was like the ultimate comfort food for me on a chilly San Francisco day after spending hours upon hours of walking the city. If you’d like to see more of my travels to this lovely city, you can check out my 3 Day San Francisco Guide. When I got back from San Fran, I knew I had to try making this wonderful soup. After scouring the internet for recipes and finally tweaking this soup to my own liking, I was shocked by how easy this was to make! Check out the 60 second Recipe Video below! I love a good comfort soup like this. I mean it has Rice, Chicken, and Lemon – what’s not to love?! I literally cannot put this down once I start eating. A second helping? Yes Please!! I used a 6-Quart Cast Iron Dutch Oven to make this. It’s the perfect size and makes for easy cleanup because nothing gets stuck to the sides or bottom of this pot. I love it. I started by added some EVOO and Onion to the bottom of the Dutch Oven. Saute over med/high heat for about 5-6 minutes until Onions are translucent and softened. Add in the Garlic and saute for about 1 minute longer. Add in the Chicken Broth, Bay Leaf, Sea Salt, Pepper, and Chicken Breasts. Bring to a boil over med/high heat. Cover and turn heat to med/low. Let it simmer for about 20 minutes. Remove the Chicken and shred it. Add the Chicken back to the pot. Add in Arborio Rice. Cover and simmer 20 more minutes. In a small bowl whisk together the Eggs and Lemon Juice. Slowly add in 1 ladle of the soups broth to the Egg mixture and whisk. Then add the Egg mixture to the soup. Stir in some fresh Dill Weed. Cook for about 5 more minutes and then serve. Taste and add more Lemon Juice if desired. In 6 Qt Dutch Oven add EVOO and Onion. Saute over med/high heat 5-6 min until Onions are translucent and softened. Add Garlic and saute 1 minutes. Add Chicken Broth, Bay Leaf, Salt, Pepper, and Chicken Breasts. Bring to boil over med/high heat, cover and turn heat down to med/low. Add Chicken back to the pot. Cover and simmer 20 more minutes. In a small bowl whisk together Eggs and Lemon Juice. Slowly add in 1 ladle of the broth while whisking, then add egg mixture into the soup. Add in Dill Weed and stir. Let cook about 5 minutes before serving. Taste and add more Lemon juice if needed. Garnish with Lemon Slices and more fresh Dill Weed. Is the egg considered cooked once it is added or is it still raw? Hi Emma, Yes the egg gets fully cooked when made this way. I cheated a bit and used rotisserie chicken and did not have fresh dill, but it was delish and pretty! I will make it again for sure! Hi, I made this soup last night for dinner it was a pretty color, looked so nice with the fresh dill on sprinkled on top and absolutely delicious! I doubled the recipe and used bone-in chicken breasts it was easy to make and well worth the effort. I literately just finished making this and it is AWSOME! I used the juice of 2 lemons and a different rice thought. You’re welcome Kerry, so glad you liked it! I did go ahead and made if on the day I needed it. It was very well received by all and my only comment was to possibly add more chicken broth next time. Can this be made a day ahead and then reheated and kept warm in a crock pot to take to a traveling dinner party? It looks beautiful and my mouth is watering already. Thank you. Hi Annabelle, I have not tried that method. If you do try it let me know how it works out! Made this tonight. Added extra lemon and made 2.5 recipe. Just had regular long grain rice and that worked just as well. Fed my hubby and I, filled a pint size mason jar for his lunch and still have a big container for the freezer. Yummy!! Thanks for a great recipe. So glad you liked it Tracy! It’s one of my favorite soups to make! Mine didn’t turn out like this at all. I went to get some of the broth out to put in with the eggs, and it was all gone!! What did I do wrong? This exact same thing happened to me and it was on the lowest setting on my stove the whole time. It just needs way more broth. Taste was great though. Thank you for the recipe! Made it this afternoon but cut the recipe in half just in case my husband wasn’t a fan but it was delicious and will definitely be on our list of soups this winter. I used long grain rice and it was fine. Half a batch would be great for singles or people who don’t,like leftovers but for us…I’ll be doubling the recipe next time. Delicious! O.M.Geeeee …. Made this last night to accompany our Chicken Kebobs and Greek Potatoes and wasn’t certain how it would turn out as I’ve tried to make this soup from other recipes but WOW, this one was easy to follow, tons of flavor and turned out amazing. My husband commented on the smell going through the house and I couldn’t help but sneak a small cup of it before bedtime. The soup is for dinner tonight so i’m guessing it will have gotten even tastier from the flavors sitting overnight. Looking forward to it again this evening. Great job on this one!!! This is my new favorite soup! I have made this three times in the past two weeks. My husband LOVES it too. I don’t use any dill because I don’t like dill, and instead of 1 lemon I used 1 and a half lemons. It’s delicious, thanks for a great recipe! I’m dying to try this recipe. However, why do u add the eggs? I’m not a fan of eggs. And actually dnt eat them at all. Will u tAste the egg? This was FABULOUS! I will definitely make it again. I, too, used long grain rice and Had very little broth when I went to ladle it into the eggs. I added 3 more cups of chicken broth and warmed it before ladling into the eggs. The juice of a large lemon was just right for us. Good thing I did because we all wanted seconds and had a little leftover. P S. I live in the sunshine state, too! So glad you liked this Melanie, that’s for the feedback! I thought this recipe was quite good and easy to make. Next time I think I may try using only 2 eggs and a bit more lemon juice. I made this and it was delicious! I had the chicken stock on hand, so I doubled the amount of broth and seasonings and it was still very thick. I can’t imagine it with only one quart of stock. Well worth the effort! Has anyone tried this in an Instant Pot? Sauté the chicken first in the pot lightly browning (not cooking all the way). Add onion and garlic and sauté until translucent. All all other ingredients and pressure cook for 20 minutes with quick release. Remove chicken, shred, and then add back to the pot. I had chunks of egg adding the lemon and egg to the pot prior to cooking. I may follow the recipe more closely and add lemon/egg mixture after cooking next time. I would also add more lemon. It was delicious! 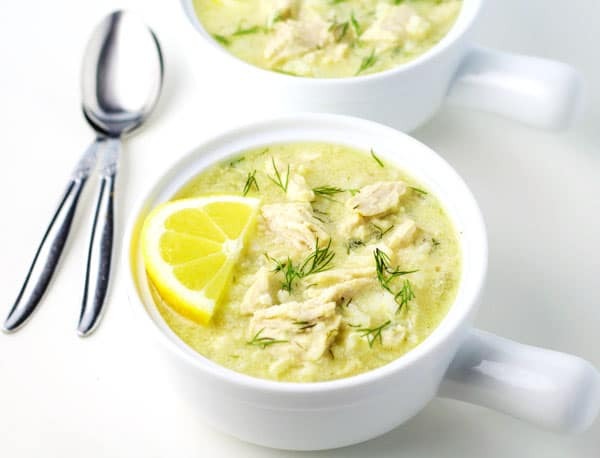 This looks delicious and I am a huge fan of Lemon Rice Soup. I’m curious to know how this soup is, re-heated, the day after it has been made. I would like to make it for a school function and would have to make it the night before. Should I add more broth when reheating? Hi Jodi, Once the eggs have been added, there’s no sure way to reheat the soup without the risk of curdling. This is the kind of soup that is best to eat as soon as it’s been made. Not to say you can’t reheat it, it just won’t be the same. Hmmm. I wonder if I could do everything except the egg and then do that the next day. Or maybe I could use something else as a thickening agent? Any advice? Jodi, thats exactly how I would do it, add eggs only to the portion you are going to consuming and save the rest for later, reheat repeat and enjoy. We have it for lunch the next day we make it every time and it reheats wonderfully. Just low and slow. Awesome Jessica, so glad it turned out for you! 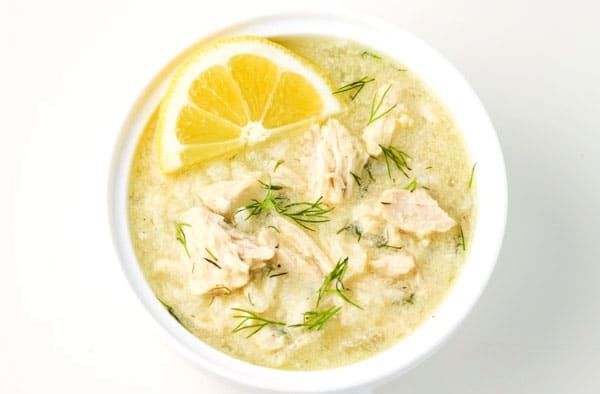 I used to work next to a Soup place that would make lemon chicken soup and it would sell out within an hour. It was the best soup I’d ever had. The place ended up leaving and I miss their soup, so I tried finding one online and came across this one. It came out SOOOO delicious! Even better than the soup place. I love it and will be making it again. But I have a question in regard to step #6. I assume this initial 20 minute simmer is to cook the raw chicken breasts that you added in step #4?… In my soup, I had gotten a rotisserie chicken, so the chicken breast was already cooked. If I do this again, would I be able to skip that first 20 minute simmer in steps #6-#8 and go right on to step #9? That would almost cut the time in half for me which might make this a lot easier to make during the weeknights after I get home from work. Thanks! Yes the 20 minute simmer is to cook the Chicken. You could certainly use a rotisserie chicken, but you would still need to cook the rice. Depending on what type of rice you use will depend on the cook time. Try tasting the rice after about a 10 minute simmer. Once the rice is fully cooked add in the cooked chicken and finish the rest of the steps. If you try this out, let me know how it goes, Cheers! I made it again tonight with a rotisserie chicken and it came out great again. I didn’t change anything because I didn’t realize the bay leaf probably needs the full 40 minutes total so I didn’t skip the first 20 minute summer. I like the rotisserie chicken because it adds another level of flavor. Delicious! Easy and fantastic!!! I use only one egg and 2-3 lemons. I also add a bit of thinly chopped carrots and celery. This soup freezes beautifully in a mason jar and has never curdled for me when reheated! This recipe is definitely a winner. Thank you! Thank you so much for the tip on freezing and re-heating! Dill flavor was too strong for me and not lemony enough. Will skip the dill and use 2 lemons next time. It certainly will help with cold symptoms in any case. I’ve been making this for years and had never used an egg before, it added a great new texture. I used brown basmati rice this time too and it really held up well. Also did not absorb as much broth over night. Thanks! Love your feedback Hunter, so glad you liked it! This soup with German spaetzle is also the bomb! Had to adjust for more broth. 1 quart not enough for us. So glad you liked it Scott! Absolutely delicious recipe, thank you. I’ve made this soup a few times now for the family and we can’t get enough of it! I only used one egg and I added diced carrots to the recipe (at the onion stage) and it gives the soup another dimension. Many thanks for adding it online, I’ll definitely check out your other recipes. How many calories do you think are in this soup and what is a serving size? I made this soup twice and I love it! Hi Samara, I’m working on getting nutritional facts added to my recipes, so as of right now I don’t have this information. Stay tuned! Can I use already cooked long grain rice for this recipe? Hi Peggy, I have not tried this using cooked long grain rice, so I’m not sure the results would be the same. If you do try it please share how it turns out! Absolutely delicious soup – I’ve made this umpteen times now and we love it! The only things I changed was I only add 1 egg instead of 3 and I add chopped carrots to the sauté onion stage – everything else is perfect! Thank you for such a delicious recipe! What Happens if I don’t add the eggs? I just don’t like the idea of it mentally. Rahel, the egg acts as a thickener for the soup. You can omit it if that’s your preference. This soup is delicious! I discovered it last year and we’ve been making it *at least* monthly ever since! Even the kids love it! I always double the recipe so we have leftovers for lunch. I do find 2 chicken breasts to be too much in a single recipe, when I double it I only use two breasts. Maybe the chicken breasts at our local stores are just bigger? I’m not sure. Either way amazing recipe and everyone I make it for absolutely loves it! This makes me so happy Elysia! 🙂 Yes chicken breasts can vary in size. I buy the organic ones which tend to be on the smaller side. We did not have luck with this soup. The eggs are not worth any thickening they might give it. I’d try it again but definitely stay away from the eggs as they are definitely not needed. Wish I had known. Good flavor but now I have a pot full of soup that tastes like scrambled eggs. Hi Kim, Adding raw eggs to hot broth without scrambling the eggs can be a little tricky. Tempering is the process of adding a small amount of the hot broth to the eggs while whisking vigorously. You’ll slowly raise the temperature of the eggs enough to add them to the soup without the eggs curdling. Remove the soup from the heat before you being tempering and never bring the soup back to a boil once the eggs have been added. You can see in the video that’s attached to this recipe how I added a ladle of the hot broth to the eggs and then whisked, then added them to the soup. Hope you give this another try! Made this soup for my husband and mother. 5 STARS from everyone! The only changes I made were adding sautéed wild mushrooms to the onion and garlic mix. Also, I used long grain white rice instead of Arborio. I made this recipe last month and it was absolutely delicious even though didn’t have any dill at the time. I bought some dill and I’m making it again today. The only thing I will change is to add more broth because last time it was quite thick. But this recipe it the Best! Thanks for sharing! Thanks for the great feedback Toi! Was really tasty! Have you used reduced sodium chicken broth to lessen sodium? Wonder how that would taste? Also I’d say a half more lemon would be good. Thank you for providing the recipe. So glad you liked it Mike! I have used reduced sodium chicken broth, and honestly I think it tastes just as good. Great recipe. I made a delicious stock with a stew hen and cut the recipe in half for just 2 bowls for lunch. Couldn’t have taken more than 25 minutes (I already had the chicken from the stew hen). And in a pinch I used risotto style rice so it might have been even a little creamier! Lovely. Thanks! Awesome Patty, glad you liked it! Excellent recipe. I love all soup and always order Avgolemono when at our little local Greek diner. It is pure comfort food with a lemon kick. This recipe is better than theirs! I tripled it and make a few changes (14 cups of broth, 6 eggs, 1 cup rice, etc) so I could share with family and neighbors. For extra nutrition, I added 2 celery stocks diced and 4 diced carrots in with the onion, garlic and oil for 5-10 minutes before adding the broth. I also added the zest of 1 lemon and juice of 2 was perfect for this large amount. I also froze 2 quarts for later and reheated Low and Slow and the egg did not scramble or break. It was as smooth and thick as when it was fresh. So, it does well the next day or month (in my case) if you want to make ahead and re-heat slowly, but I am certain the immersion blending of the eggs/lemon juice helped with this smooth texture. If you don’t have a hand held blender, you can do this in a regular blender. I also added the fresh dill just before serving as a garnish, not to the soup pot or it is likely to brown the fresh dill. Is there any chance that you would have the caloric and /or the nutritional information? This soup was easy to make and delicious, but way too thick. Needs more than 4 cups of chicken broth.